The beautiful community of Mt. Gilead is an upscale community that is located in the Murrells Inlet in Garden City, South Carolina. The community is gated for resident’s security and privacy. Some of the homes in the community have their own private docks for owners to launch their boat from. There is a large variety of home types in this gorgeous community and the prices range from $200,000 to $1,000,000. 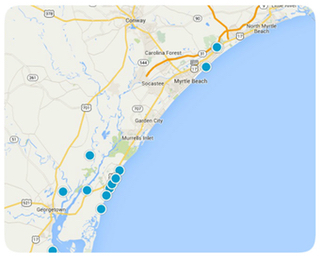 If you are looking to live near the beach the Atlantic Ocean is only a short drive away from Mt. Gilead. There are many areas for residents to enjoy shopping, dining, entertainment, nightlife, golf, and outdoor recreation. Residents are also close to all of the amazing attractions that are located in the Myrtle Beach area. Feel free to take a look at the beautiful homes we have available and let us know if you have any questions or interest in any of our homes. Listing courtesy of Dunes Realty Sales , Billy Nichols. Listing courtesy of Garden City Realty, Inc , Bobby Streett. Listing courtesy of Ocean Front Guru Real Estate , Dervilla Bucci. Listing courtesy of CB Chicora Advantage Surfside , Janice Ash Sialiano. Listing courtesy of Beach Realty South, LLC , Lance Garrison.